Wednesday, March 3 at 8:00p.m. Elizabeth Perez is a decorated U.S. Marine veteran and mother living in Ohio. 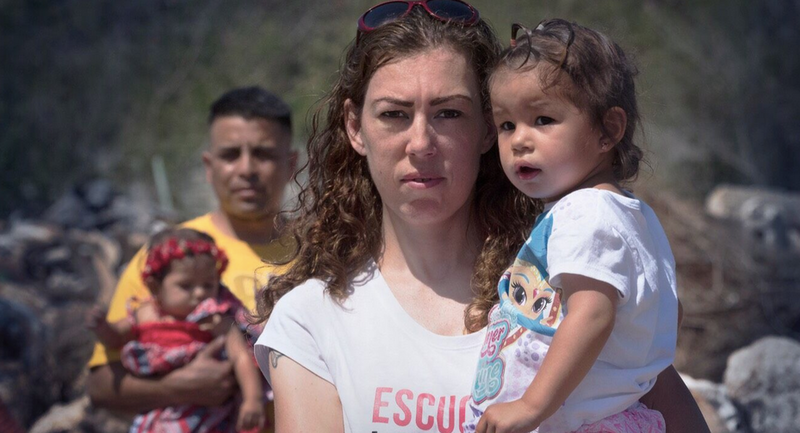 When Marcos, her undocumented husband, is deported to Mexico, her tireless efforts to reunite her family hit a legal brick wall. MARCOS DOESN’T LIVE HERE ANYMORE is a love story about a couple grappling with the realities of our nation’s immigration system. With its raw intimacy, the film examines the inner workings, and failures, of deportation and reveals the human cost through an unforgettable portrait of a couple and their children. Award-winning Director David Sutherland screened KIND HEARTED WOMAN at SFF 2013. He spoke to Salem Film Fest writer Sarah Wolfe before the New England Premiere of MARCOS DOESN’T LIVE HERE ANYMORE on Wednesday, March 3 at 8:00pm. SW: Welcome back. Your latest film captures a side of deportation we rarely see in the media – the personal toll on families. DS: These stories of separation often live in the shadows. When undocumented workers – many without criminal histories – are sent away after decades of living in this country, there’s often family left behind. SW: How did you discover Elizabeth Perez and her story? DS: I wanted to do a film about immigration. I spent a week in Washington, DC, at a conference for The National Domestic Workers Alliance, which advocates for immigrant workers, and found several potential people to profile. And then I contacted my son’s best friend who works with immigration issues, and he connected me to Veronica Dahlberg at HOLA, the undocumented workers advocacy group in Cleveland that we see in the film. I went out there several times and filmed people for test footage — what I like to call sketchings. SW: That’s a great term for it. DS: It helps me plan for the film’s overall portrait. I often start out doing something and then make numerous adjustments. For example, for my film THE FARMER’S WIFE, I worked with 52 farm families over 2 ½ years – a minimum of four days with each family – until I found the right subjects. SW: Woah, that’s quite a process! DS: And it’s different with every project. I was interested in filming Dora and Luis first, who we see in this piece. And then Veronica mentioned Elizabeth’s powerful story and had her drive me to the airport after my second shoot in Ohio. We had lunch before my flight and really got along. Half of Elizabeth’s family is also from eastern Kentucky where I filmed COUNTRY BOYS. She reminded me of one the kids in the piece. I decided to film Elizabeth’s story in parallel with Dora’s, but the latter woman’s situation changed when she got her citizenship. So, in the end, Elizabeth’s family became the focus. SW: Your films have been described as unfiltered and deeply intimate. We see Elizabeth and her husband, Marcos, at their best and worst. How did you gain the trust of this couple and of Elizabeth’s fellow HOLA members? DS: What works for me is keeping an open mind and speaking from the heart. And I try to present a person the best I can by capturing their likeness – by creating a portrait. I really got to know all these people when my crew and I were riding in cars with them, visiting their homes, and when we saw them after they were detained by ICE and had the preacher and civil rights advocates there. So this was very close up for me. All my films are like that, but this was different in that the years were dragging on to get Marcos back, he and Elizabeth were both becoming depressed, and questions started arising about whether the relationship would last. SW: We learn that Elizabeth and the children tried joining Marcos in Mexico prior to this film, but it was too much. DS: Elizabeth didn’t want to live there because of the bad conditions and especially because Marcos was in such a dangerous part of Mexico. I had to film down there with bodyguards. At least 20 of the people you see in the piece were deported and some are dead because of the violence. SW: That’s so frightening. I imagine you learned a lot about the U.S. immigration system while making this film. DS: I certainly did. Veronica introduced me to David Leopold, the lawyer in the film, and he was very clear about immigration law. For example, say someone is an illegal immigrant and has been accused of a crime. If they’re deported before being convicted, their record will say they were charged with a felony. They’ll have no chance to prove their innocence while out of the country and that felony will be used against them trying to return to U.S. soil. There are so many things about immigration rules we don’t know. Things were bad during the Obama administration when we began filming, though it was different from the current administration’s approach – especially in regards to the treatment of children. The only thing that’s consistent about immigration policy is that the rules continually change. SW: I can see this film creating a divide among viewers. Those who believe that our immigration laws need to be upheld, that ‘you come here illegally, you get deported.’ And those who want the laws changed — who call out the U.S. for knowingly providing jobs, homes and schooling to illegal immigrants, only to take it all away and separate families. DS: I do hope this film creates a conversation. The one thing, though, that people can’t disagree with is that Elizabeth has done a lot for her country as a Marine and veteran. She lives semper fidelis – always faithful to this country and always faithful to Marcos. And part of her patriotism is every so often being able to take a stand. We’re not saying Marcos deserves to come back or doesn’t. Let the chips fly and let viewers decide. The bottom line is you get to see a family going through this hellish experience with our immigration system. And, even if you don’t want to, you can’t help but care about them as human beings. Tickets for MARCOS DOESN’T LIVE HERE ANYMORE can be purchased here. A Q&A with Director David Sutherland will take place following the screening.